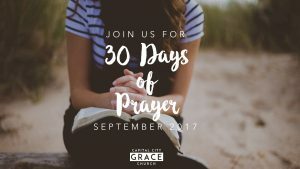 Join with us on our 30 Days of Prayer journey. Use the guide below as your personal prayer guide to pray for our church, our city, and the world. Get daily prayer updates on our Facebook page. DAY 1 – Sun., Jan. 15 – For the one person in your life who does not yet know Christ. That you would have the courage to share the gospel when the opportunity arises. Commit to regularly praying for this one person throughout the year. DAY 2 – Mon., Jan. 16 – For the church as we gather people to our worship service and other church activities throughout 2017. That God would use our ministries (Worship Service, Small Groups, and other connecting times) to reach people and that everyone would feel welcome. DAY 3 – Tues., Jan. 17 – For our Small Groups to do life together, live in faith everyday, and live out the truth of the gospel. DAY 4 – Wed., Jan. 18 – Church Leaders: For our pastors (Eric & Danny), and for the Core Team (Tony Myers, Jason Paragon, Danny Guerena, Eric & Julie Miller) to have the vision to equip our church family to live on mission for the gospel. DAY 5 – Thurs., Jan. 19 – For yourself, if you are anxious about anything, tell God what you are worried about. What can you praise God for today? DAY 6 – Fri., Jan. 20 – For the leaders of our country, for the leaders of our State, and the leaders of Columbus. DAY 8 – Sun., Jan. 22 – For provision of all the financial and material resources that the church needs to be an effective light in our city. DAY 9 – Mon., Jan. 23 – That we daily spend time with the Lord and His Word, growing in our knowledge of Him in order to apply it daily in our lives. DAY 11 – Wed., Jan. 25 – That our church will effectively train and disciple every adult who desires to grow in Christ. That everyone in our church has an opportunity to serve using their gifts. DAY 12 – Thurs., Jan. 26 – That we will know we are deeply loved and highly valued by God, not because of what we do but because of all Christ has done for us. DAY 13 – Fri., Jan. 27 – For Children’s Ministry teachers and helpers to lead with passion for Jesus, children and the children would experience the love of Christ through them. 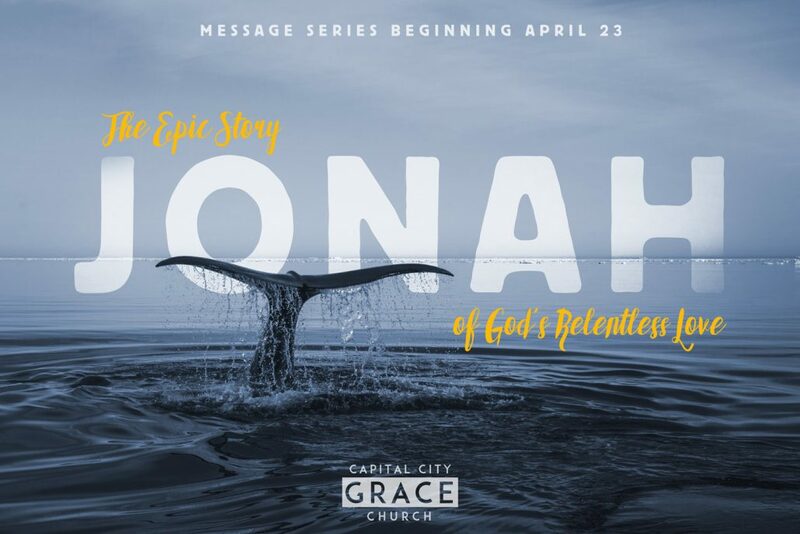 For the children of Capital City Grace to grow in their relationship with Jesus, or to place first time faith in Christ. DAY 14 – Sat., Jan. 28 – For God to provide our worship team with musicians, skilled in their craft and in helping others worship Him through song. DAY 15 – Sun., Jan. 29 – Pray for all those who serve on Sunday mornings: Worship (Danny), Sound (Jonathan C.), Set up (Danny, Jonathan, Johnny Boykings, Clark), Greeters (Johnny, Tony, Clark), Preaching (Eric), and Children’s ministry workers. Pray they would rely on God’s strength. Pray for all who come to worship God and experience His community today. DAY 16 – Mon., Jan. 30 – Serving Our City: Ask God to help you notice any needs in our city. Ask Him how we as a church can serve to help meet those needs. DAY 17 – Tues., Jan. 31 – For churches in your neighborhood. Pray they would grow with people coming to know Jesus, and these churches would continue to be a bright light in the city. Pray God’s blessing on them. DAY 18 – Wed., Feb. 1 – That more leaders within the church would emerge, realizing the call and capacity that God has given them for His kingdom. DAY 19 – Thurs., Feb. 2 – For our Small Group Leaders (Vicki, Tony, Amy, Paul & Shyla, Eric) to raise up biblical disciples in relational environments, helping them take next steps in their growth and maturity in Christ. DAY 20 – Fri., Feb. 3 – That our church would continue to be a bright light as we worship at Hyatt Place Hotel. That we would continue to be loving and servant-hearted towards the staff and hotel guests we see on Sundays. DAY 21 – Sat., Feb. 4 – Be still. Ask Jesus what you should pray for – listen to Him. 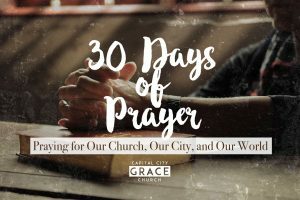 DAY 22 – Sun., Feb. 5 – That our Worship Service would grow and always be a place for people in our city to connect with God and others. DAY 23 – Mon., Feb. 6 – Pray for the needs of those in the church family. If you don’t know of any needs, contact a church friend today and ask them how you can pray for them. DAY 24 – Tues., Feb. 7 – For the global Church, our fellow believers around the world, that they would stand firm under affliction and to look forward to eternal glory. DAY 25 – Wed., Feb. 8 – Pray for our missionary, Amy Paragon with Women of Grace. Pray she would be open to the Spirit’s guidance and focused on magnifying God through this ministry as she performs both roles of Women’s Leadership Studies coordinator and of facilitator. DAY 26 – Thurs., Feb. 9 – Ask the Spirit to search your heart and reveal any areas of unconfessed sin. Acknowledge these to the Lord and thank Him for His forgiveness. DAY 27 – Fri., Feb. 10 – For Capital City Grace’s mission: to see all people pursue Christ. For God to give our church a spirit of unity around our mission, protecting us from divisions over unimportant issues. DAY 28 – Sat., Feb. 11 – For the one person in your life who does not yet know Christ. That you would have the courage to share the gospel when the opportunity arises. Commit to regularly praying for this one person throughout the year. DAY 29 – Sun., Feb. 12 – That God would specifically raise up more volunteers to serve in every area in our worship service.